This mount fits most of 26-55" TVs sold today. It fits TVs with mounting holes as close as 3"x3" or as wide as 16"x16" (in TV terms - VESA 75x75mm to 400x400mm). 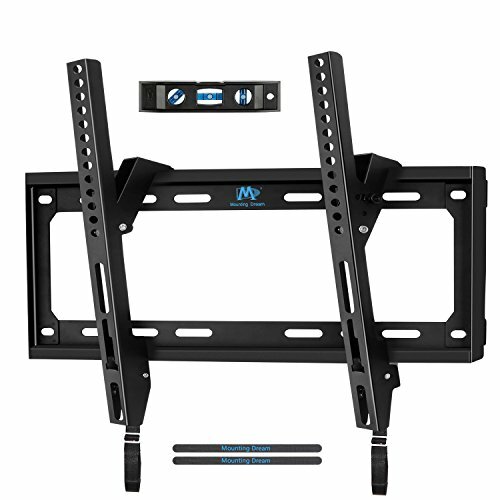 This mount is constructed with heavy duty steel materials and with durable powder coated finish, which makes the mount sturdy and ensures mounted TV stable and secure, supports TV weight up to 88 lbs. This mount fits for studs up to 16" plus concrete wall typical in US homes (For installation above fireplace and TV need to be centered, it is recommended to buy larger mount ie MD2165-LK). All installation hardware included except concrete wall anchors, which will be sent per request. All our mounts are not for dry wall alone applicaton! You can slide the TV assembly left and right over the horizontal bar of the wall plate but still can prevent the TV assembly from falling off from the horizontal bar because of the stop plates at both ends of the bar. Fits most 26-55" TVs up to 88 LBS, with max VESA/mounting holes spacing of 400 x 400mm. Our mounts are tested 4 times loading weight claimed. Images on left side will help you see if this mount perfectly fits your TV in the aspects: VESA, studs spacing and possible blocked input. Not perfect? You can check other Mounting Dream mounts for BEST options. Place your TV close to wall, 1.5" flush profile, saving space greatly with stylish appearance. Easy installation with decent instruction, one-piece wall plate design and all included hardware in pre-labeled bags. Pulling straps lock and release TV breezily. Comes with Bubble level and Velcro ties for cable management. Concrete wall anchors will be sent per request. If you have any questions about this product by Mounting Dream, contact us by completing and submitting the form below. If you are looking for a specif part number, please include it with your message.